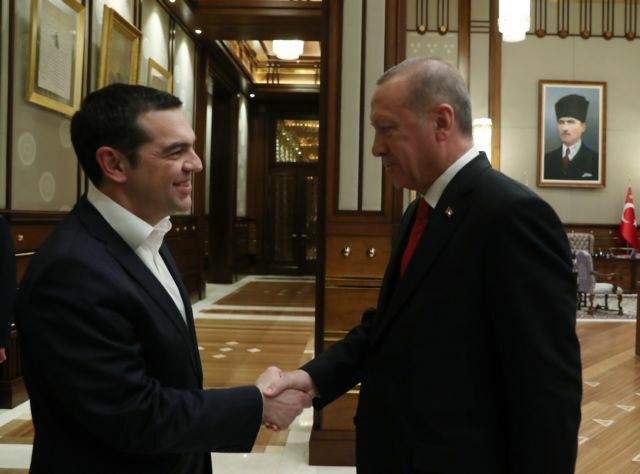 Tsipras expressed heightened concern over dangerous military indidents in the Aegean and he underscored the importance of the direct line of communication with Erdogan. Prime Minister Alexis Tsipras and Turkish President Recep Tayyip Erdogan held no-holds-barred talks in Ankara this afternoon and confirmed that they wish to lay the foundations for a bold, historic resolution of decades-long disputes, from the Aegean to the Cyprus problem. A dour-faced PM explained that he was not able to extradite eight Turkish officers implicated in the failed 2016 coup against Erdogan because the Greek judiciary ruled against their extradition and the separation of powers is enforced in Greece. Ankara blew up the affair today by declaring a bounty of 700,000 euros for each of the eight. Effectively, it called on bounty hunters to abduct the officers on Greek territory, where they have been granted asylum, and return them to Turkey, a singular breach of sovereignty. Tsipras reminded Erdogan that he was among the first to call and express his support right after the coup failed. Tsipras said that the coup put the brakes on the bilateral relationship, and he underlined that Greece condemns all coups and any effort to dismantle the democratic form of government.That was in part because of the eight officers and the two Greek officers that Turkey captured and released months later. The Greek PM also expressed heightened concern over the dangerous military situations that arise in the Aegean and he underscored the importance of the direct line of communication between the two leaders. Essentially, the two leaders announced an expanded, multi-level dialogue, and Tsipras cited energy cooperation as a priority. For his part, Erdogan expressed a keen interest in the Muslims of Western Thrace, including the demand for direct election of muftis. Tsipras said that the two peoples are coming closer and that they want their leaders to follow suit. The two sides are planning new confidence-building measures and the return of exploratory talks on the delimitation of the Aegean continental shelf. There will also be military-to-military dialogue in an effort to defuse tensions in the Aegean and safeguard against potential accidents. On the crucial migration issue, Tsipras said that he wants more returns of migrants to Turkey and to root out the migrant transport rings. Tsipras also announced that there will be more intense security cooperation, which may signal the prospect of Athens handing over members of the network of Muslim cleric Fetullah Gulen, who has been blamed for the coup. On the issue of the re-opening of the Ecumenical Patriarchate’s Halki Seminary, Erdogan essentially proposed a quid pro quo that Athens has long rejected. He said that he also expects Athens to allow the Muslims in Thrace to elect their muftis, legal scholars who also judge some family law cases.